Mixed emotions on Ridgid Drywall Screw feeder. This things does work and is quicker and easier than hand placing each screw. You may use more screws. It has given me fits to figure it out. Powered graphite seems to have helped the tape advance mechanism to work more freely. Read the directions carefully and follow them. 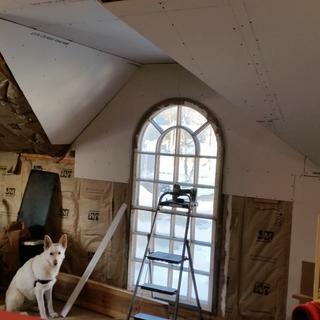 Screwing the ceiling up tight next to the wall or in any situation where it is difficult to hold tool perpendicular to the wallboard, results in high screws. Collated screws are expensive, but save time. Recently it quit working not driving the screws and stripping the wood out of the hole. That was my fault as the tool was accidently reversed (rotation) and I did not realize it. This tool coupled with a drywall jack has enabled me to work alone and make decent progress. Overall I am glad I made the purchase as it has saved me time. Awesome tool. Saved me so much time. This is an amazing tool at such a great price. 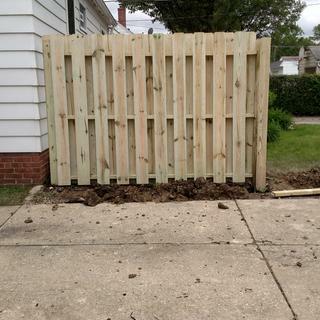 Put up 48 feet of fence, board by board, by myself in one day time! No more getting stabbed by a box of screws. Only thing to make sure is it is at 90 degree when driving a screw because it will drive the screw no matter what.Could not even tell this thing was reconditioned. I buy all my tool for my shop right here at CPO!!! Screw gun was inconsistant. Sometime would not feed correctly and jam other times it would not drive screw all the way in. After 2 sheets of drywall I was so frustrated I decided to send back and buy another brand. Thanks CPO for their excellent support and return policy. From 1"-3" screws only & bits are interchangeable.. DOES ANYONE KNOW WHO SELLS SCREWS FOR IT IN JACKSON,MS. BEST ANSWER: Try Home Depot or pretty much any big box store or Lumber yard, too. Please contact Ridgid directly at 866-539-1710 for parts. Can this tool be used for securing pressure treated wood decks? I would say no but I have used it for doing floor underlayment. Can this screw-gun be used to install Hardibacker? Specifically, are screws available for this gun that are suitable for this purpose and will the gun work for that purpose? I'm guessing the answer is no, but would like to confirm...thanks. BEST ANSWER: It looks to me, just like the Senco gun that I use for laying down hardi backer board using the square drive screws. You should be able to change drive bits to any drive you want. I am assuming that you can use Senco bits in it. It works great for that purpose. Screws can be purchased at any home improvement facility or hardware store in your zip code. where can i buy replacement bits for this drill??? BEST ANSWER: Ridgid is a home depot brand so home depot usually has this bits. chances are that loves does too. Kentec tools also has bits. not sure if they are where you are or not. Please contact the manufacturer direct at 1-866-539-1710 for assistance with parts. I have the R6790 model. Can I get bits near Canton Oh. 44680 ? BEST ANSWER: Screws can be purchased at any home improvement facility or hardware store in your zip code. Home depot, lower, or Kentec tools has the bits maybe hardware stores too. BEST ANSWER: The screws can be purchased at any home improvement facility or hardware store in your zip code.